Congratulations to thefemalelion, giveaway winner! 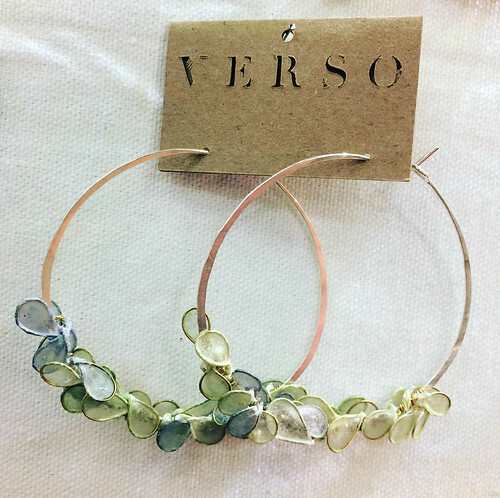 How pretty are these cherry blossom hoop earrings by Melanie Brauner of VERSO Jewelry?! Each piece she creates is intricate and unusual... the translucent paper that Melanie makes by hand has the look of stained glass. 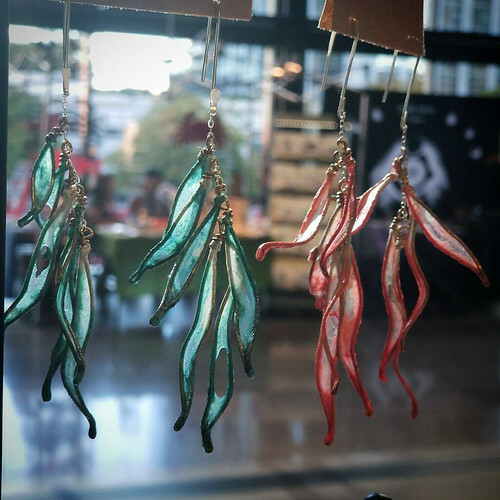 In fact, she was recently video-interviewed by the folks at Chihuly Garden and Glass in Seattle where her work is a perfect fit for the museum's gift shop. 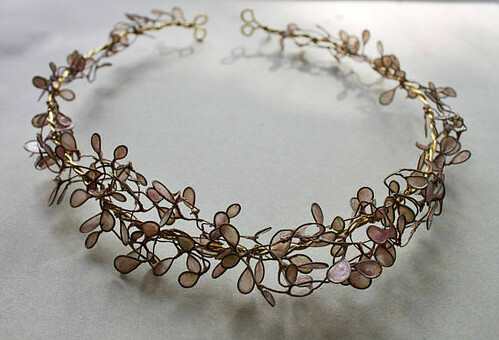 Melanie creates VERSO jewelry by dipping hand-shaped wire forms in abaca paper fibers that are suspended in water. Often dye is added to the mixture. The fibers cling to the wire and shrink as they dry, causing a tight paper skin to build up on the form when it is repeatedly dipped on successive days. The forms are then sealed to make them water resistant and durable. 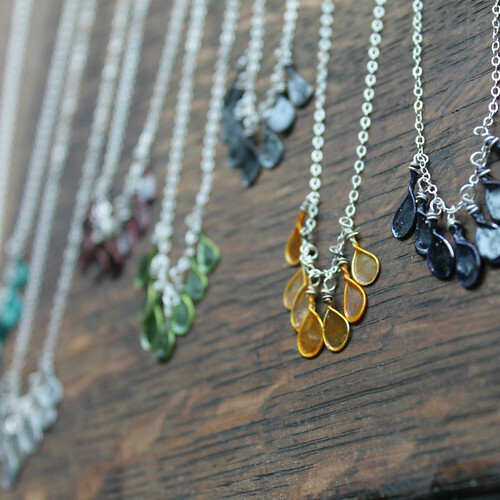 Due to their handmade nature, variations occur from piece to piece, adding to the organic charm. 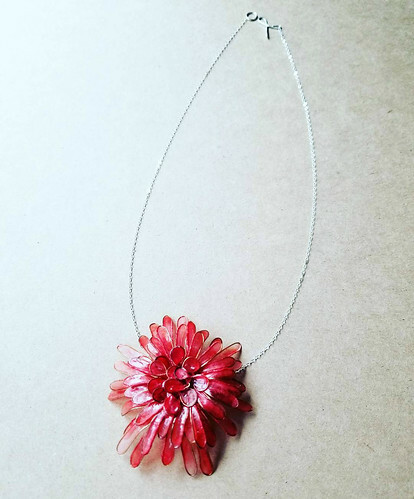 This statement necklace, a chrysanthemum in vivid shades of pink and red, is composed of waterproofed handmade paper and brass petals on a sterling silver chain. 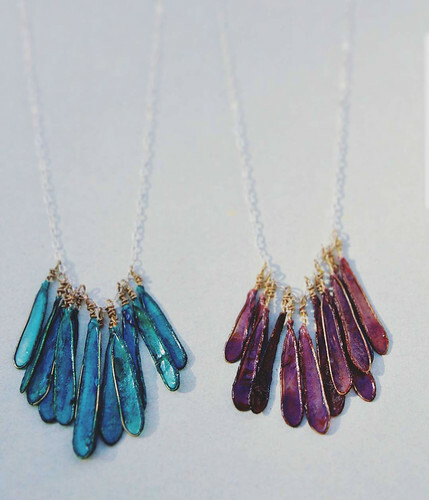 ...and delicate in appearance, yet surprisingly strong clusters of Morning Dew petals hang on necklace chains. Dragonfly abaca paper and brass drops are wired to an 18" sterling silver chain with a sterling silver handmade clasp. Each paper drop is about 1" to 1.5". 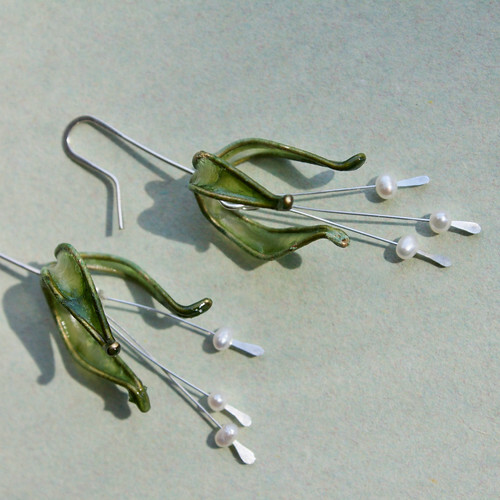 Moss green lily earrings feature hammered sterling silver and freshwater pearl drops with sterling silver earwires. This is a photo I took of a piece Melanie made for me a couple of years ago... it is still as beautiful today as it was when it arrived from Washington state. 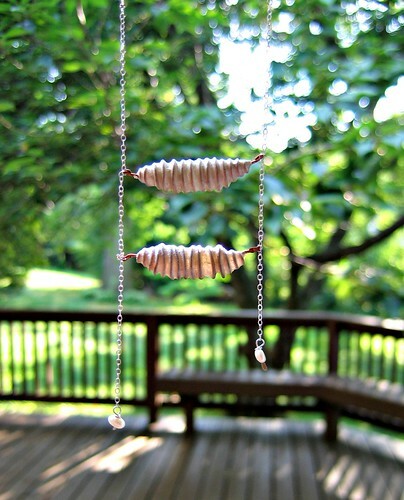 Called a Cocoon Necklace, the abaca-dipped copper wire beads are durable, yet lighter than air. The fine chain is sterling and the ends are capped with freshwater pearls... it's truly a conversation piece. And now the international giveaway! The winner will receive a $50 gift certificate to spend at VERSO Jewelry on any item or items of choice. To enter the giveaway, browse the website or Etsy shop, VERSO Studio, and leave a comment below. Note that Blogger does not allow me to see the email address you type into the form with your name, so you will need to include an email address within your comment. If you are concerned about spam, type it this way: janedoe at gmail dot com. This giveaway is also underway on Instagram. Enter at one or both places by the end of Saturday, December 2, 2017. The winner will be announced at the top of this post and on the Instagram giveaway photo as soon as she or he has been notified. Good luck! Giveaway ends Saturday, December 2, 2017. 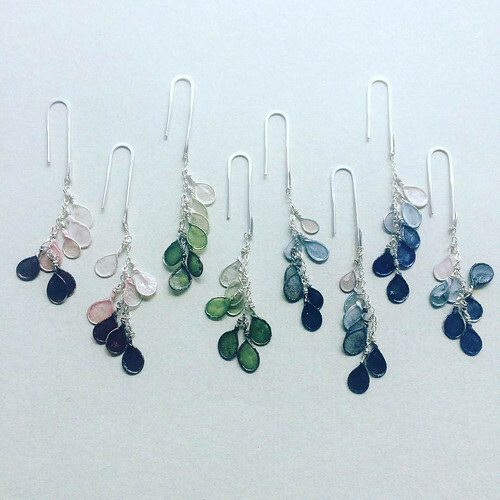 VERSO Jewelry is also on Etsy, Instagram, Facebook and Pinterest. These are really lovely. They have a lightness that is very attractive. These are gorgeous pieces, Ann. I am always impressed by paper artists. Who can resist a crown? Beautiful. My goodness - these are so pretty and delicate! Beautiful stuff. Very creative work with a lot of patience involved. Thank you for the opportunity to win. Absolutely beautiful work. Each piece is a real work of art. While I love all the pieces, because I have a yard full of them every summer, the lily is my favorite. These are fabulous!!! I love the dangle earrings and that chrysanthemum necklace is outstanding!!!!!!!!!!!!!! Absolutely beautiful! Would love a chance to own one of these pieces of artwork! !